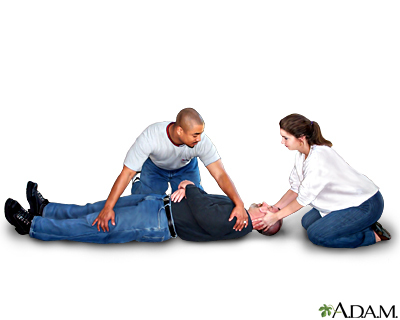 To roll an injured person two people are needed. One person is stationed at the head and the other at the victim's side. The person on the side places one hand on the victim's shoulder and the other on the victim's thigh area. 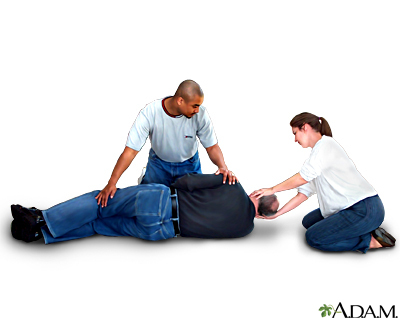 The person at the victim's head stabilizes the head and neck so that the head and neck does not bend, move, or twist in any direction. With the coordinated movement of the rescue team the victim is carefully rolled on his side while the head and neck are supported and kept in alignment. Paying proper attention to the care of an injured victim can help prevent additional spinal cord injury.